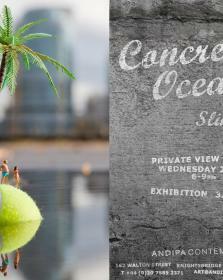 Andipa Contemporary is delighted to announce a new solo exhibition CONCRETE OCEAN by renowned urban artist Slinkachu. “…some twelve billion years ago the gods created the universe, including the [...] dinosaurs and such like, but after a while found these huge creatures rather tedious [...] Turning from gigantism to miniaturism, the gods then created little creatures on earth, including humans...” Shapiro & Bennett, The Politics of Moralizing, 2002. In turn, Slinkachu, the arch miniaturist, has placed his 1:87 scale installations in a city that is, from the perspective of the Little People, a Concrete Ocean. Or is it also a concrete ocean from our perspective? We city-dwellers often feel that sense of being overwhelmed by the urban environment, we empathise with the vulnerability of the Little People – not least as they are abandoned by their maker either to be trodden underfoot by a careless passer-by or to startle a less careless one. We laugh at their barely significant perspective on life, their diminutive world view and sharply reflect that perhaps ours is equally narrow and our lives are just as insignificant. Teetering on the edge of the metaphysical abyss, the dry, ironic wit draws us back to laughter. After all, a proud podgy man on a tennis ball in a puddle as big as a lake, who really thinks he is a god as he surveys the view and his pretty wife does not know that he has been entitled The Last Resort. Looking at these photographically recorded installations one has the impression of zooming in and zooming out. One feels close to the situation and distanced from it. For the first time, Slinkachu has seemingly reversed his usual process: he has seemingly uprooted paving stones and parts of pavements and brought them into the gallery. The figures stick to these urban islands, oblivious that the boundaries of their world are so limited. Oblivious that they will float forever on the concrete ocean that is their (and our) home. Concrete Ocean is the second solo exhibition of Slinkachu’s work to be shown at Andipa Gallery and follows Whatever Happened to the Men of Tomorrow (2009), which focused on the relationship between an old, bald, Superman rejected by the city which once lauded him.